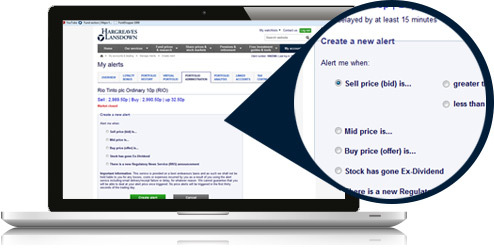 You can set up share alerts for any UK-listed stock quickly and easily online. This feature is FREE for all HL clients. If you don't have a Hargreaves Lansdown account yet, you can open an account online in minutes. Easily and quickly set up to 50 different share alerts. when a new announcement is made. Your alert will last up to 90 days, and you can manage your alerts online at any time. Log in to your account and select 'Account settings'. Select the 'Email preferences and share alerts' tab. Click the 'Manage share alerts' button. Find the stock you are interested in. Press the bell icon to create an alert. Select the alert type you require and press 'Create alert'.